"Karma(驚異世紀)" is HKTV's new horror television series starring Dominic Lam(林嘉華), Noel Leung(梁小冰), Leila Tong(唐寧) and Lawrence Chou(周俊偉). The 9-episode series is divided into 8 different horror stories. 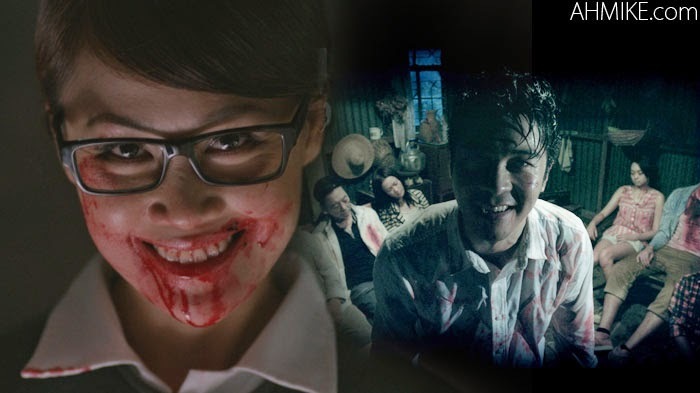 Last night was the premiere of "Karma(驚異世紀)" and the horror-themed TV series drew rave reviews online since there hasn't been any horror series aired on Hong Kong television for a long time. After the first episode titled "Parasite(寄生獸)" was aired, many netizens discovered that most of the scenes were apparently inspired by a Japanese science fiction horror manga series called "parasyte(寄生獣)". From the way the story uses hair to inspect the identity of infected individuals to burning the head to kill off the parasite-controlled host, they are all similar to the storyline in the manga. While some netizens claimed the main story where the entire crew is stranded on an island is similar to "The strain" and "The Thing". CGI is heavily used in these types of horror related stores. Maybe due to budget, the CGI effects weren't 100% convincing. But with the way HKTV combining Chinese ghost story and other horror elements into one complex story-line, many people have high hopes for the series. I watched the first episode. It was actually pretty good. Better than watching old people drama like Liza Wang's limelight year. Noel Leung is a good actress. She could be TV queen if she's still at TVB.